Melampodium leucanthum produces fragrant honey scented flowers from spring until fall. Flowers are white with yellow centers and look like daisies. Leaves are linear giving the plant an overall fine texture. This is a Texas Native plant and prefers excellent drainage and will do well in sun or partly sunny locations. Blackfoot Daisy can get 6-12″ tall. 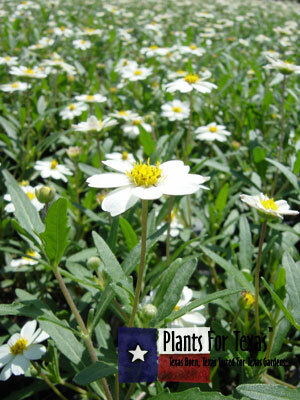 This Daisy is great for rock gardens as well as in mass perennial plantings. Melampodium leucanthumis part of our Plants For Texas® Program, meaning it was Texas Grown, Tested in Texas to perform outstanding for Texas Gardens.